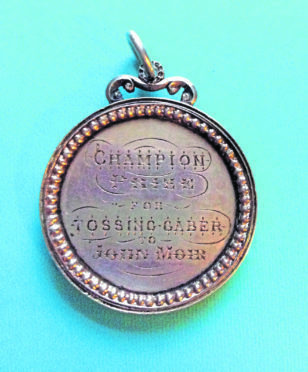 The small white metal medal, which features an ornate design, was presented to John Moir of Strathdon, Aberdeenshire for winning the champion prize for tossing the caber, having already beaten six other athletes to win the all-comers competition for tossing the caber. It was won in the days of Queen Victoria, just a year after the death of Charles Dickens and three years before the birth of Winston Churchill. And now a rare medal, awarded to a competitor at a famous Aberdeenshire event, has been returned to the group which handed it out in the first place. The organisers of Aboyne Highland Games have been reunited with the honour that was presented in 1871 to John Moir of Auchernach, Strathdon, for tossing the caber. His bauble was one of six champion prizes distributed in 1871 at what was the fifth games, with the others awarded for bagpipe music, throwing the light hammer, best dressed Highlander, throwing the heavy hammer and dancing Highland reels. Mr Moir defeated six other athletes to win the all-comers caber competition and finished second at putting the light stone. Measuring 5cm in diameter, the double-sided white metal artefact features a beaded design that surrounds recessed faces that are engraved on both sides. The ornate circular medal is topped off by a scroll embellishment and small clasp. It has recently been donated anonymously to the Aboyne officials. Tossing the caber continues to be an integral part of Highland Games throughout the world. At Aboyne, it is one of only a handful of disciplines which have been contested at every event held since 1867. Last year, to mark its 150th anniversary, Aboyne Highland Games commissioned a new caber, a 23ft 6in-long Douglas Fir, dedicated by Her Majesty The Queen, with the monarch pouring a dram of commemorative whisky over the timber. Alistair Grant, the chairman of Aboyne Highland Games, said: “This little medal is a small, but fascinating piece in the history of our games. “Tossing the caber has been an integral part of Aboyne Highland Games since its founding. Therefore, it is fitting we have been reunited with this champion prize medal 150 years after the games was established. The 2018 Games will take place on Saturday, August 4 on the Village Green in Aboyne. Online registration for all competitions is currently open and participants interested in competing can enter at www.aboynegames.com.